Their reports will be gathered and published in a book for wider distribution, but for now—at this late September gathering on the campus of Midwestern Baptist Theological Seminary—the task is to listen and learn what their listy observations hold in common. Midwestern Seminary’s “miraculous transformation” is not the subject of this meeting, although most every speaker references it in his opening remarks. They speak of Allen’s impact, engendering confidence in a once-struggling institution. They take note of the new chapel that rises above a green slope at the entrance to the Kansas City campus. The building in a clean prairie style was completed just as Allen assumed the presidency of the school two years ago. A couple of speakers reference the rise in enrollment. And there’s some discussion of the just-announced $7-million gift to build a much-needed student center and dining complex. Among the notables here is an unnamed presence, Charles Spurgeon, the famous 19th century British preacher and evangelist. Midwestern recently acquired much of Spurgeon’s personal library collection and has converted the former chapel space to house it. There’s a lot of informal conversation about Spurgeon. Most attenders take the tour. But amid obvious historical footings and with the insight of SBC heads, the subject is the future. 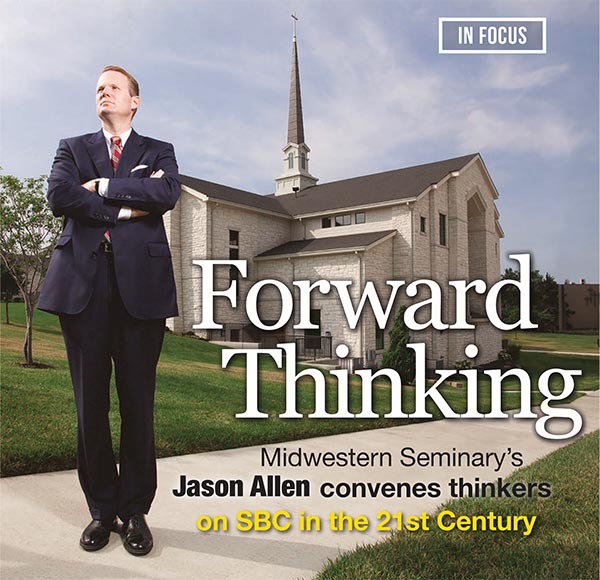 At 38, fresh in his seminary presidency, Allen draws experienced leaders and thinkers to look forward—and tell us what they see. Many questions about Baptist identity seem to have been answered in the past 30 years. Starting with the Conservative Resurgence in 1979, Southern Baptists have affirmed biblical inerrancy and ended a lean toward mainline Protestant liberalism. That shift also ended whatever tendency Southern Baptists would have had toward cultural accommodation. We aren’t mainline or mainstream, and as the culture moves farther left, we don’t want to be. We know who we aren’t, but who are we? The more recent issue for Southern Baptists is that of Reformed theology: Just how Calvinistic are we. Trinity University President David Dockery calls Southern Baptists “modified Calvinists” because we are not consistent in all five points. Three of our seminaries are more strongly Reformed, products and by-products of Al Mohler’s 22-year presidency at The Southern Baptist Theological Seminary. At this conference, only Paige Patterson, President of Southwestern Baptist Theological Seminary, was clearly not Calvinist. He raised the issue of evangelistic zeal, and questioned whether the growth of Calvinist adherents will cool the baptismal waters further. “Evangelism will have to be reestablished as the majority of the Great Commission,” Patterson said. He criticized church planting that does not produce new believers. Talking about the gospel is as far removed from effective witnessing as talking about race cars is from driving in NASCAR, Patterson said in a pithy list of analogies. The more current “ecclesial crisis” is that of regenerate church membership. In the quest to reach seekers and postmoderns and millennials, church membership has been devalued, and more specifically, the certainty that people who join our churches are in fact believers in Christ as evidenced by baptism. The sages are almost uniform in their desire for Southern Baptists to have stronger theology and firmer confessional expressions of those beliefs. Too many people are members of SBC churches because it’s the family church, their friends go there, or they like the music—not because they hold strongly to the church’s theology. Not to devalue our “tribal identity,” Mohler said, but “the tribe is not enough.” Tribalism—this informal gathering based on traditions and relationships—will give way to cultural accommodation, he warned, whereas confessional conviction will give believers (and thereby the denomination) theological moorings to withstand societal pressures to surrender to sexual redefinitions and moral decline. Mohler asked whether today’s generation will “summon the courage” to face these issues which will require of them vigilance. The current era is one of warm evangelicalism whose backbone is softening, to summarize several speakers. That makes this “the Baptist moment” according to Mohler. Among evangelicals, Baptists are best positioned to give the issues of “late modernity” a solid biblical, theological response. The discussion among panelists on “passing the baton” was playful at points with elder Patterson describing youthful Allen as “a man not yet dry behind the ears.” At another time Patterson, turning, 73 this month, commented, “I came on the scene right after Polycarp was martyred.” (That’s 155 A.D.) In these moments, it’s clear the baton is passing. Mohler framed the handoff this way: “We have to ensure that there is healthy, courageous generational transition” in such a way that there is a Southern Baptist Convention in the future. For Dockery, the handoff is more than from one generation to the next. It must be intergenerational. “Most Southern Baptists (and most Americans) do not find our identity in generations; our identity is in Christ.” Dockery says the handoff is also international and global, given the growth of evangelicalism in Africa and Asia. Cooperation indicates compliance with a mindset and participation in a program, whereas collaboration implies partnership and full participation by all parties involved. As a denomination comprised mostly of smaller congregations, collaborative ministry “gives everyone a seat at the table,” Page said, including the SBC’s over 10,000 ethnic churches. But there’s education to be done. And it’s not only younger leaders who need the crash course. “We find there is a lack of understanding among ethnic churches of collaborative missions,” Page said. But it was Dockery who pointed out that while the SBC has made strides in righting the sin of prejudice (the “one stain” on our record, he said), greater effort is required to bring minorities into leadership. “This is no time to fly solo in the culture,” SBC President Ronnie Floyd said, “and no time for a church to fly alone.” Floyd’s presentation had the same listy character of the other speeches, but as a pastor, his list was most practical. Floyd in particular called for a reduction in duplication (“and triplication”) of ministries and services by local, state, and national entities. Larger state conventions, especially in the South, often offer their own versions of education, missions, and church planting; but since the implementation of the Great Commission Resurgence five years ago, those conventions have shifted funds to the national SBC in an effort to more effectively share the gospel in “new work” or frontier areas. And state convention staffs have been reduced by one-third, from 1,750 nationally to 1,350. Making the denomination leaner is part of the thrust toward more effective collaboration. Floyd raised the issue of mergers, naming the International Mission Board and North American Mission Board as one possibility. “How can we leverage where we are and what we have and who we are to reach forward in a unprecedented manner” to advance the gospel?